By CandidCupcake on September 27th, 2011 . Filed under: Cupcake Ideas . Artist Jonathan Arras has combined the world of cupcakes with the world of dragons in his watercolor art. 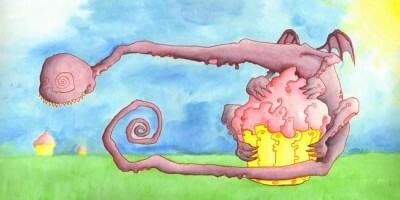 If you’re a fan of mythical creatures, then head on over to his webpage, Spirals in Love. He says that some of the common themes in his artwork are “delirious love, loneliness, and giant desserts”. I don’t know about you, but I really love the giant dessert part, especially when it involves cupcakes, as this painting does below. His work has also been featured on All Things Cupcake before, so be sure and check that out as well.